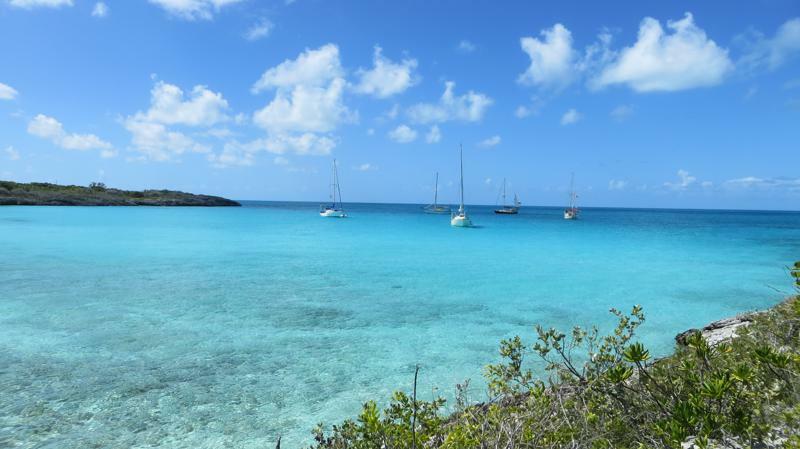 We’d departed Salt Pond, Long Island with a fabulous group of friends, bound for Flamingo Cay, in the Jumentos Cays. Per usual when sailing among friends as soon as the anchors were off the bottom the race began! It was a fabulous sail! 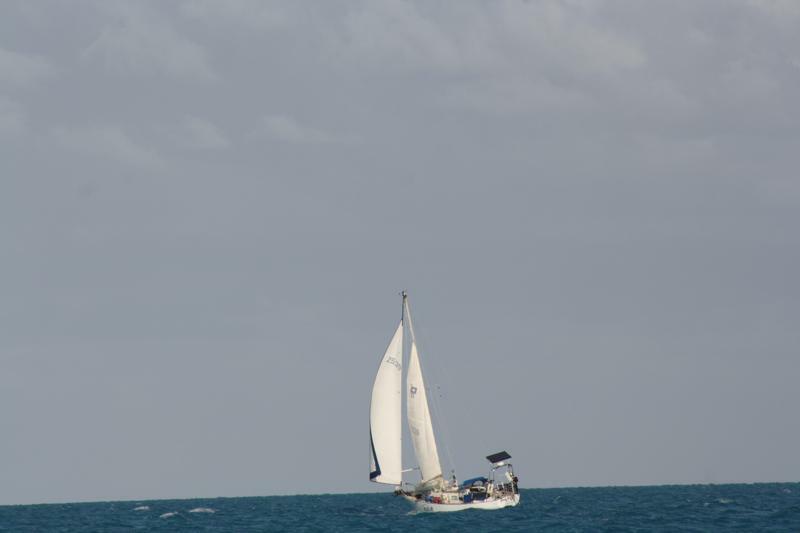 Rode Trip had her first opportunity to fly double head sails; jib and genoa. We hanked-on the genoa and flew the jib freely. 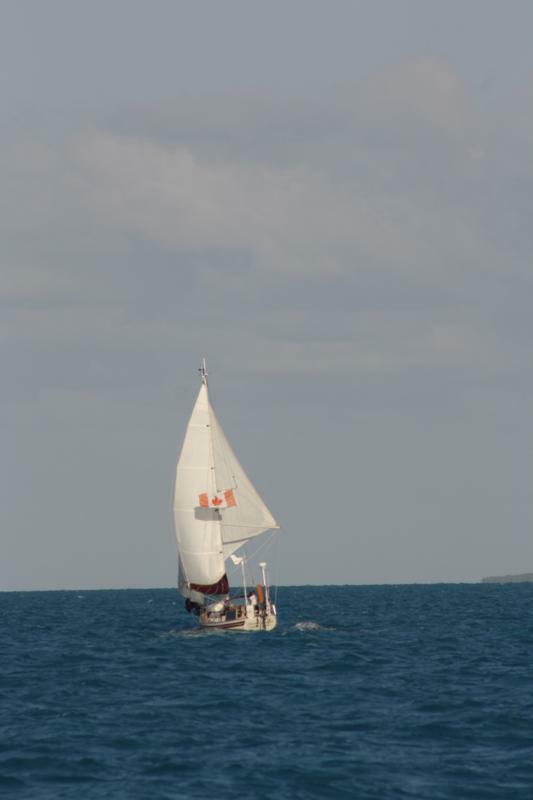 With the head sails rigged and the main down, the windvane steered marvelously down a straight course line. It was a beautiful day for Brian, the Birthday Boy, and while we sailed along topside down below a bake-off was underway. Everyone pulled out their best cookie recipes to make birthday treats for our arrival. At Flamingo Cay we had the entire anchorage to ourselves. 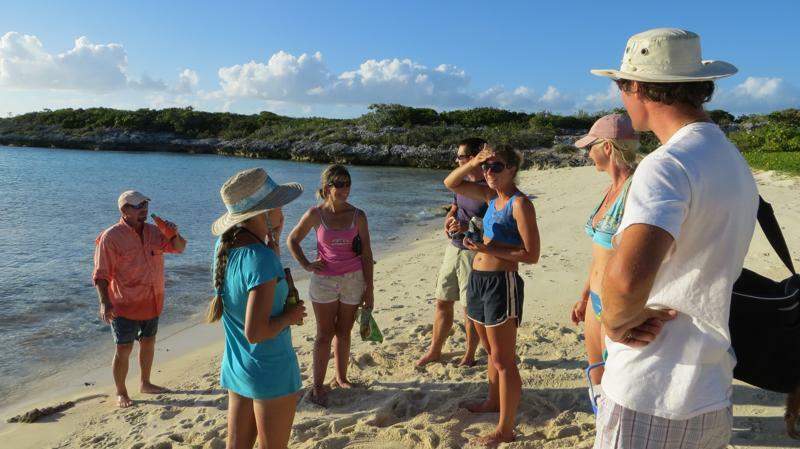 Once the boats were settled at anchor, we took to the beach for cold beers, fresh cookies, and a re-cap of the day’s sail. Happy Birthday, Brian. Hope you both have a great time in the Jumentos! Great photo shot of the double head sails, too. Looks like a beautiful spot you found! Great way to spend a birthday. Happy Birthday Brian! Looks like you had a great day. I get such a chuckle that your email arrives this morning ….where we here are facing another seriously cold day in the Winter That Never Ends !!! It says 21 degrees outside on our thermometer and typically it is always actually colder than that outside….Sigh!!! Happy Birthday Brian. 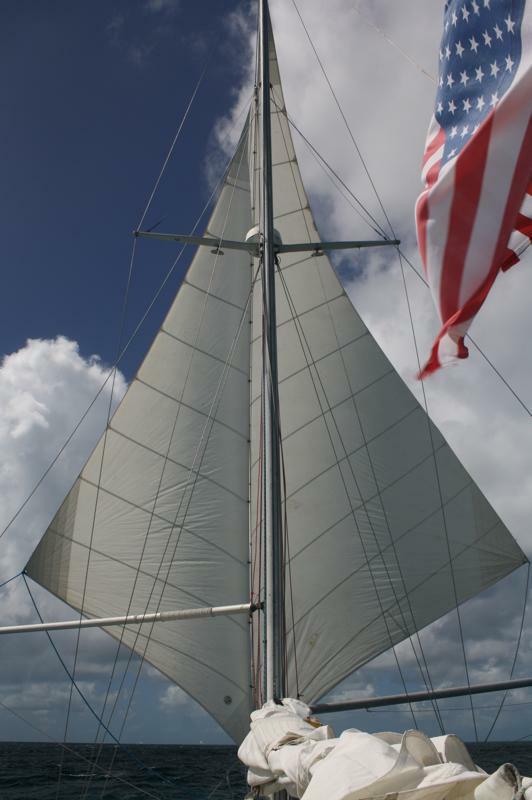 Love the picture of you sailing under a twin head sail rig. We did about 60% of our two circumnavigations under twin head sails. Bill, the southern Bahamas are AMAZING!! Scott, we are having a BLAST with the double head sail rig. We still have to tweak some of our set-up and take-down, but once set it is lovely sailing! Couldn’t have accomplished it without your fabulous plans! Ann, so glad we could finally access the internet and share our current travels with you. Down in the Jumentos and Raggeds we are really off the grid as far as communication goes. Bummer it is SO COLD back home…more reason to snuggle! Dennis, what better way to spend a birthday than “racing” among friends! 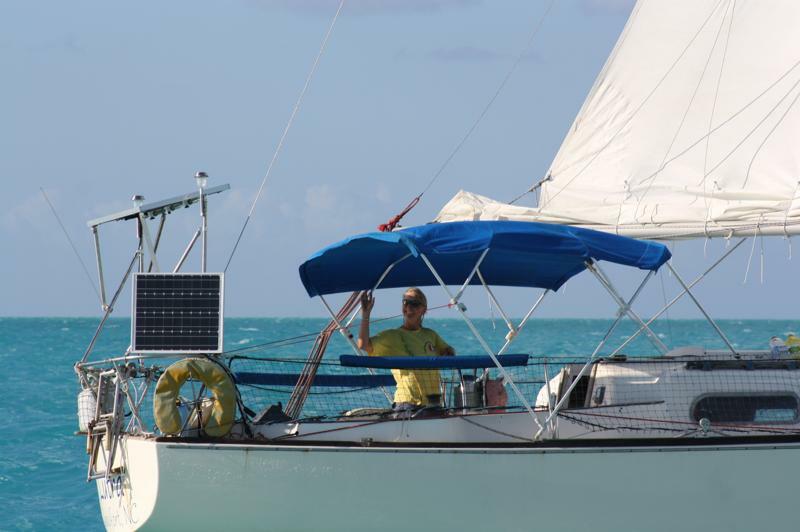 So great to sail with equally matched boats; 2 Pearson 35′, 1 Bayfield 32′, and 1 custom catch 36′. I must say though that none of these had the courage to raft-up to the mighty Westsail. That sail rig look so COOL! Looked like a beautiful day. Happy Birthday Brian….a little late. Us Laser guys miss chasing you around the buoys. But damn, it looks like fun cruising (of course us racers would never do well with it). Screw the double jib thing…we’d rig a spinnaker and a blooper! Thanks. For the Birthday wishes! I certainly had a good one. Now you’ve got me thinking about more sails….if we tear out the v- berth we could probably add a couple spinnakers and a blooper…hmm we don’t really need a place to sleep!